The 1927 models were similar to the 1926 models. Black wire wheels became standard on the closed cars late in the year but were optional until that time. The Roadster-Pickup could be provided with the spare rim rack on the side. Platform Body $50 ----- 4,344 The 1927 Sports Touring. Note the wire wheels, top boot and wind wings. * January 1, 1927 to December 31, 1927. ** Includes starter and demountable wheels. *** Chassis production figures are for U.S. and foreign. Truck figures include trucks of all body types. See production charts. Starter production is not listed separately. **** Pickups not listed separately from Runabouts. 28,143 pickup bodies were produced in 1927. Note: Starter and 21-inch demountable wheels were standard on all cars. Starter was optional on the truck. Wire wheels were an option but became standard equipment on closed cars at during the last several months of production. Pickup body for Runabout, $25. Automobile production ended May 26, 1927 but trucks and engines continued for some time. ENGINE SERIAL NUMBERS:14,619,255 to 15,076,231 calendar year. 14,049,030 to 15,006,625 approx. 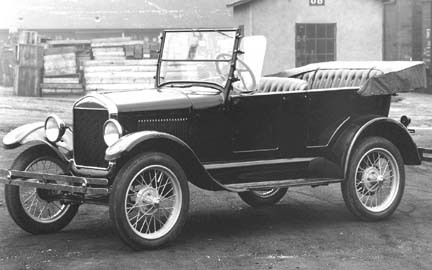 model year (August 2, 1926 to May 26, 1927.) Note: Records show that the last Model T was serial number 15,007,032 but according to the engine production records, only engines (not cars) were built on May 31, 1927. There was no production from May 27 to May 31, and then engines and/or trucks began again with serial numbers 15,626,006 to 15,007,032. MODEL YEAR DATES: August 1926 to May 26, 1927. BODY TYPES: Same as 1926. 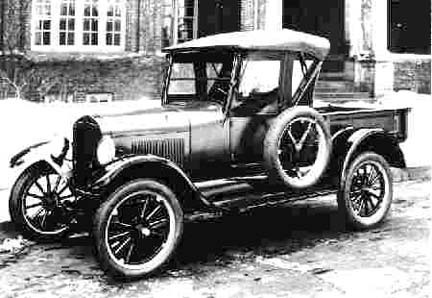 MAJOR MODEL YEAR FEATURES: Chassis in passenger cars was made of heavier metal; minor construction changes were made during the year, but generally the same as the 1926 models. Color options on all cars. Wire wheels were standard on closed cars beginning in late 1926. The hot plate (Vaporizer) carburetor was standard in 1927 models. COLORS: All cars had black fenders. Various body color options, ultimately on all models. Black no longer available except on special order. UPHOLSTERY: Imitation leather in the open cars. The pattern was a stitched vertical pleat design on both seat bottoms and backs. Closed car upholstery was gray cloth with green stripe on the green cars, and gray with a red stripe on the maroon cars, then became gray with a white strip on all closed models, regardless of body color. SPLASH APRON: Same as 1926. RUNNING BOARDS: Same as 1926. HOOD: Same as 1926. Painted body color. DASHBOARD (Firewall): Steel, now a part of the body cowl (except in the Fordor). CHASSIS: Same as 1926. 1927 models generally used heavier steel and a stronger rear cross member. Shock absorbers were offered as a dealer-installed option, front and rear (mounted at the center of the axles). STEERING COLUMN ASSEMBLY: Same as 1926. FRONT AXLE: Same as 1926. REAR AXLE: Same as 1926. Later versions used a pipe plug filler screw, replacing the 15/16 hex-head screw. DRIVESHAFT HOUSING: Same as 1925. REAR RADIUS AND BRAKE RODS: Same as 1926. WHEELS: 21 demountable wheels were standard, wire wheels optional on all models. Late in the model year, black wire wheels became standard on closed cars. SPRINGS: Non-tapered, front and rear. U shaped shackles. RADIATOR: Same as 1926. Nickel shell offered as an option on most open cars, was standard on the closed cars. ENGINE: Similar to 1926. Cylinder head bolts (and some others) were given nickel-plated heads, apparently to dress up the car. The single-door valve cover no longer had the hole for the carburetor throttle rod because the Vaporizer control rod ran across the top of the engine. ENGINE PAN: Four dip pan is standard. OIL FILLER CAP: The mushroom-shaped cap, made of steel, with three flutes. ENGINE CRANK: Same as 1923 one-piece type with the rolled-in-place handle sleeve. ENGINE FAN: Mounts on the water outlet and was adjusted by an eccentric arrangement. Aluminum pulley of different dimensions from the 1925 type. MANIFOLDS: The Vaporizer carburetor and manifold assembly was now standard. CARBURETORS: The Holley Vaporizer is standard. A few Kingston Regenerators were also used on some production. CARBURETOR STOVE: Not used on Vaporizer-equipped cars. MUFFLER: Pressed steel type with no tail pipe. FUEL TANK: Mounted in the cowl on all cars except for the Fordor and truck. The Fordor continued the tank under the drivers seat; the truck used the oval tank under the seat. COIL BOX ASSEMBLY: Same as 1926. HORN: Six volt electric now standard. WINDSHIELD: Same as 1926 but with stronger stanchions on the open cars. TOP: (Open cars). Same as 1926. SPEEDOMETER: Not standard equipment but a Stewart 490 was quite common. TURTLE DECK (on Runabout): Same as 1926.